The 5.7L New-Generation Hemi motor is a relatively potent powerplant. Stock out the door, it is rated at 340 horsepower at the crank and, on your typical honest dynamometer, this translates to about 285 rear-wheel horsepower delivered to the pavement. That makes for a fun grocery-getter that is surprisingly practical given the motor's rated 25 mpg/highway rating, which it will actually achieve. However, being an enthusiast I was interested in getting more out of it. Especially since I was tracking the car. I had incrementally added a bit here and a piece there, and prior to the new motor, I was running about 360 rwhp when running my track-only, not-street-legal PCM. That level of power will move a 4400 lb station wagon along nicely. Combined with the suspension modifications I had in place, the car was able to fill the mirrors and demand a point-by from many who never thought it would make it out of the paddock. Still, the sheer weight of the car was a serious drawback. On Laguna Seca for example, I was very frustrated with the fact that I could eat up some very impressive turbocharged and/or AWD sports coupes on the twisty portions of the course, only to be left in the dust as we rounded Turn 11 and my great big fat wagon couldn't haul itself up to speed at a reasonable rate; leaving me to make up the ground I had gained all over again. A large-displacement, normally-aspirated motor was put on the shopping list specifically because of that time-and-again experience at Turn 11. 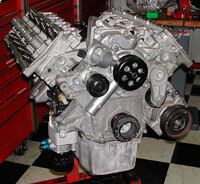 The motor was to be based on a 5.7L block, and would be bored to a larger displacement as well as stroked. All components in the rotating assembly would be forged for durability. In fact, everything about the motor would be developed for durability given that its intended application was road course racing. The size chosen for the motor -- 390 cubic inches -- was unusual. Your typical bored-and-stroked 5.7 block is run out to 392 cubic inches; a number that has some history behind it in the Mopar world. By boring out to only 390 inches we would be maintaining a little more wall thickness (the 5.7L block is notorious for not having enough wall thickness to comfortably accept a 392 overbore, depending on the individual block). This would potentially buy us some longevity. On the top side, the already-ported heads were ported again to accept a 6.1L intake manifold. The entire valvetrain was upgraded. 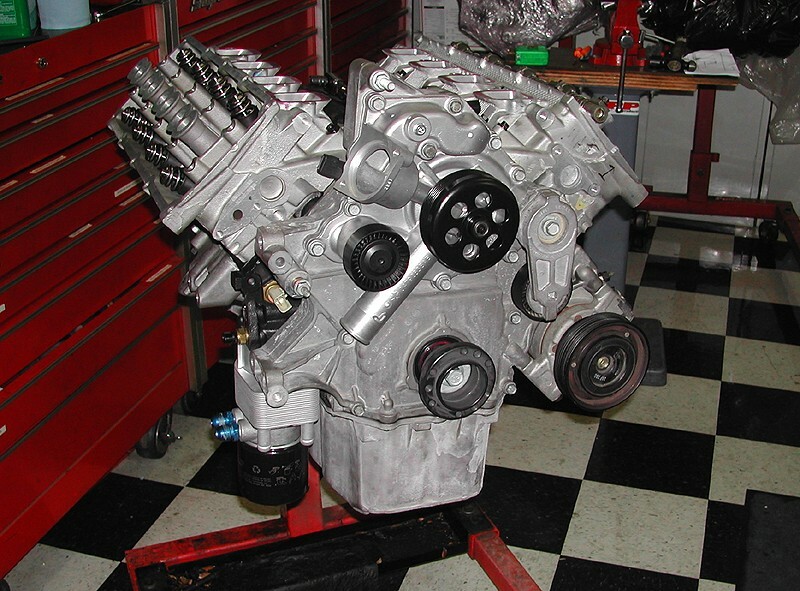 The multi-displacement system (which allows 4-cylinder shutoff) was removed, which allowed higher-performance components (particularly a cam) and a custom cam was put in that was designed specifically for the intended application. Many more small bit-and-piece upgrades were dropped in under the hood (anyone who has done a motor project knows how that goes... the list never seems to stop) until eventually, after months of effort, the project was done. There are other, more powerful built-Hemi motors out there. However it is generally agreed in the Mopar enthusiast community that there are none that have taken the punishment that this one has, and is still taking today. The short 2008 track schedule included 11 events that were the rough equivalent, in 'race time' of 2,750 passes on a drag strip. In 2009, if everything holds together, that number will be at least equalled and most likely surpassed. UPDATE: It was. 2009 incorporated 13 track events covering 14 days. The 2010 season will kick off in late February (I've had enough of rainy race tracks) with a 2-day event at Willow Springs.